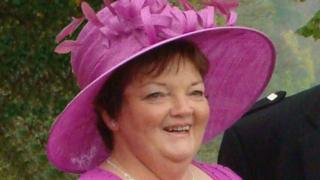 The family of a woman who died 10 days after a car crash in Aberdeenshire have described her as "a proud mum and a devoted nanna". Dorothy Cruickshank was one of six people taken to hospital after the two-car collision on the A90 at the Toll of Birness junction on 5 April. The 66-year-old, from Hatton, was a passenger in a Volkswagen Passat which was in collision with a Peugeot 207. A statement from her family said: "We'll be lost without her." It added: "Dorothy always had a smile on face. She was a proud mum of three daughters and a devoted nanna. "We are completely broken and devastated by the loss of our kind, caring, adorable and loving mum who was also an amazing wife and the best nanna in the world. "We'll be lost without her and no words can express how much pain we are feeling. "We would like to express our sincere thanks to the emergency services and the staff at Aberdeen Royal Infirmary Accident and Emergency, Intensive Care and High Dependency Units for all their care and support." The other casualties from the crash were the 70-year-old driver of the Volkswagen and four 18-year-olds in the Peugeot who all suffered serious injuries. Police Scotland have said a report on the crash will be sent to the procurator fiscal.